Medal of Honor recipient Marine Sgt. 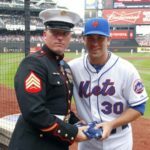 Dakota Meyer is presented with an American flag by Mets' Josh Thole. Attorney Keith Sullivan, discussing Medal of Honor recipient Dakota Meyer, 23, of Columbia, Ky., who just missed the deadline to apply for a position as a New York City firefighter, and was told he would have to wait another four years for the chance to apply. Meyer said he missed the earlier two-month application window because of the whirlwind events surrounding his Medal of Honor, which he was awarded by President Obama on Sept. 15. When they heard his story, city officials asked a federal judge for permission to re-open its books for aspiring firefighters so that a decorated US Marine can realize his dream to join the FDNY. But Congressional Medal of Honor winner Marine Sgt. Dakota Meyer doesn’t believe he’s entitled to an exception and has declined the invitation.